Well, looks like I am on a roll! I posted an entry in I Heart Faces last week and now another this week - don't faint now! Pets, (read any kind of animal), is the feature this time and while you I know that we have the most gorgeous looking cat in. the. whole. wide. world. I am sure that there will be many almost as cute moggies entered - so I have decided to enter this shot I took about a month ago at the Melbourne Zoo. 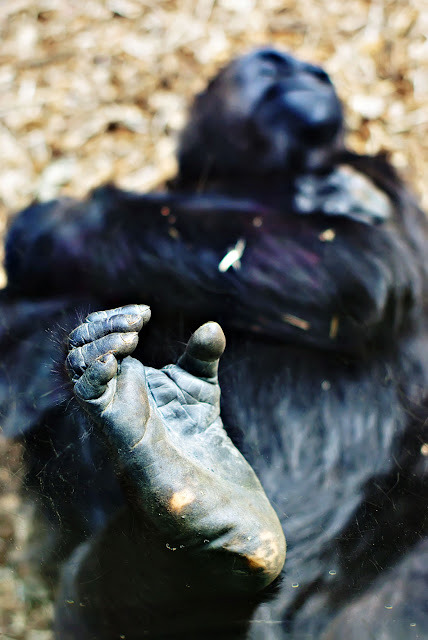 Mr. Gorilla (as he will now be known as he is a massive beast and deserves a LARGE amount of respect) was just lounging in the winter sun with his foot up against the glass window, eyes closed, arms folded. I'm sure he was saying that he was bored of us and that we were of no consequence. That's how I felt anyway. You really do need to click on this image to view it larger - the detail in his foot is just wonderful - plus you also get to see the lovely scratches and scrapes on the glass in their full glory. After you have finished viewing here, please head on over to the I Heart Faces Blog and share your commenting love - we all love to get comments - plus you will get to see some seriously gorgeous and funny animals and some seriously gorgeous and talented photogs! Wow, really cool shot. Love it! The dof is perfect. I laughed at his "I don't care about you" attitude and that is such a cool shot of his foot! Great capture! I have a photo just like this that I took at the zoo just last month! They must like using the window as a foot rest! First, how fun to be able to visit the Melbourne Zoo. Secondly, this is a fun and different shot with great detail. Love the focus and the blur! Good luck in the challenge! Oh Kate! What an awesome capture this is!!! I love the detail in his/her foot. I have never seen one that close... AMAZING! Fabulous job! Wow cool photo!!! I like the pov! Thanks for your comment :D What a great photo K8! I love it!